Stryker CEO Kevin Lobo reported continued momentum in robotics and 3D printing technology, and told investors he was not concerned about increased competition in either field. 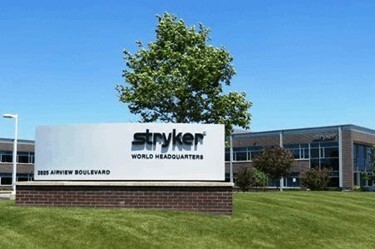 Stryker delivered “topline performance earnings” that will be leveraged into R&D spending, as well as possible acquisitions and strategic investments, said senior leadership. Stryker’s $2.96 billion in Q1 net sales represented 18.4 percent growth across all segments and geographies for the Michigan-based company, according to a press release. Top performing segments included Orthopedics, with a 7.4 percent sales increase, Neuro and Spine with 7.3 percent, and standout MedSurg with 36.2 percent growth in net sales, 25.8 percent of which is attributed to acquisitions. Two of Stryker’s largest acquisitions of 2016 — Sage Products for $2.78 billion and Physio Control for $1.27 billion — are both off to a slow start due to “recall challenges,” said Lobo. “We remain confident in the underlying strength of both Physio and Sage and expect them to be back on track for the balance of the year,” said Lobo in an earnings call transcribed by Seeking Alpha. Katherine Owen, Stryker VP of strategy and investor relations, added that she expects full recovery for both businesses by the end of the second quarter. Owen also discussed continued rollout of the MAKO robotic surgical system, which was acquired by the company for $1.65 billion in 2013. Stryker has staggered the system’s introduction over time while implementing training sessions for orthopedic surgeons and “methodical” system upgrades. In the first quarter of 2017, Stryker installed 18 new robots and trained 200 surgeons at 90 different locations. Though the system could one day be expanded to accommodate further applications, Owen noted that the company planns to focus solely on total knee replacement for the time being. Stryker also is seeing high demand for its 3D-printed technology, a strong growth-driver in its spine business. According to Lobo, there will be a number of new products launched over the course of this year, as well as some products that will return to the market after being removed. Growing competition from Smtih & Nephew and Zimmer, who recently expressed interest in robotics, is not a concern for Stryker, said Lobo.